November is much more than Thanksgiving, parades, and football. While I love ALL those thing some times you just want to change things up. This is true for me this year because my now almost 4 year old is all about the holidays. 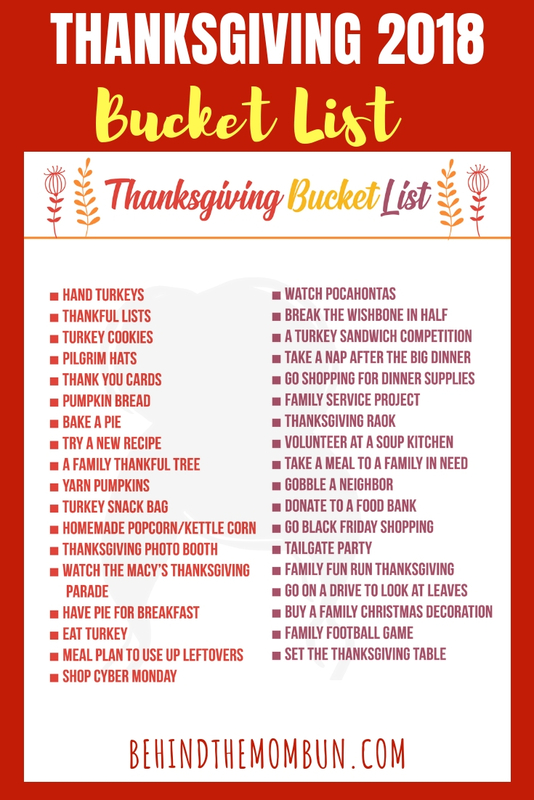 Make Thanksgiving 2018 with the awesome little bucket list. From acts of service to fun activities, there will definitely be something to make Thanksgiving 2018 the most memorable yet. Click Here to grab your free Thanksgiving 2018 Bucket List. Be sure to let us know which activities were your favorite? This Thanksgiving Bucket List printable is solely owned by Behind the Mom Bun. You may not sell or share this file in any way. Personal use only.